According to the definition of Ramachandran et al. (Proc. R. Soc. Lond. 1997,264, 645-647) mirror agnosia indicates the condition by which patients confuse the mirror image of an object with the real object and try to grasp it on verbal commands. The patients seem to believe that the mirrored image is real and the true object is inside the mirror or behind the mirror. This behavior occurs after right parietal lesions and is not due to spatial neglect. The clinical assessment of this condition consists of presenting a large mirror (generally on the right side of the patient) and certifying that the patient is able to recognize it as a mirror. Then the patient is required to recognize the object reflected in the mirror (with the real object standing on the left side of the patients) and to grasp it. The patients should be able to recognize and to name the object. Patients with mirror agnosia try repeatedly (at least for 20-30 seconds for each object presentation, and several times for repeated sessions) to grasp the objects inside the mirror with their right hand. Probably, after repeated corrections and cues by the examiner, the patient could finally learn that the image in the mirror is not a real object but the initial insistence to grasp the mirrored image of the object has to be evident. This behavior cannot be explained by unilateral spatial neglect (although not completely or directly), autotopgnosia, Balint’s syndrome, anosognosia, alloesthesia, prosopagnosia, visual apperceptive agnosia. This behavior should be differentiated from prosopagnosia (a form of visual agnosia often exhibited by patients with Alzheimer’s disease who lost abilities to recognize visually facial identities). However, mirror agnosia (according to the Ramchandran’s definition) is observed also, probably more frequently, in patients with advanced dementia. I suppose that mirror agnosia probably represents a default in semantic representations of objects, when these representations should be integrated with their spatial coordinates. The symptoms could be related to defective image processing and integration between the right parietal region (on the ‘where’ visual dorsal stream) and the right semanting-spatial brain ventral occipito-temporal regions (the ‘what’ visual stream). However this behavior should also implies for its manifestation a defective capacity of reality or checking which is another functional domain within the executive (and not spatial) functions of the brain. 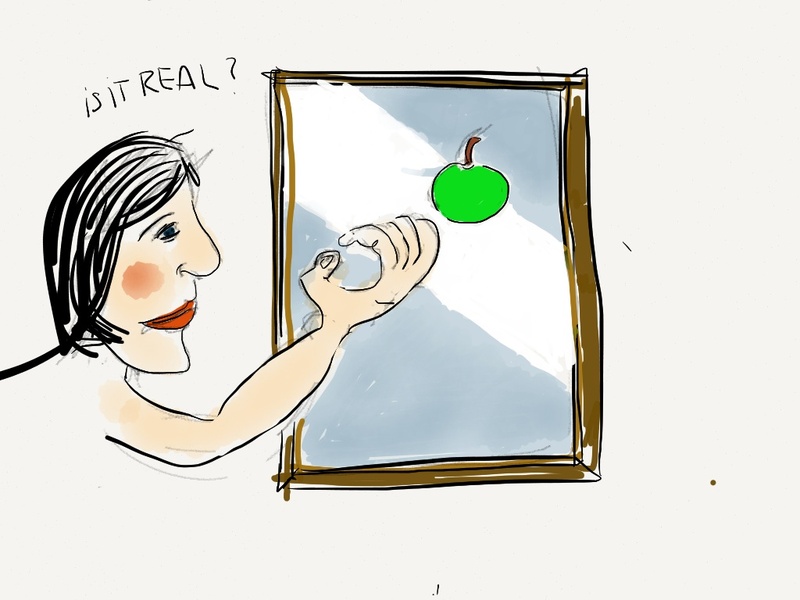 A defective reality checking intervenes also in other and different ‘mirror’ syndrome such as the mirrored –self misidentification (the delusional belief the one’s reflection in the mirror is a stranger). Mirrored-self-identification can occur in schizophrenia (unreal identity checking, or delirium of the doubles) and can be also induced by hypnosis. Everyone in the morning, looking at the mirror, sometime, (especially if there some lack of sleep ) I am sure, can ask himself for few seconds the question : is that one myself?. I know several ‘normal’ persons who look at themselves in the mirror all the daylong! It would be useful for the neurologist to have a large mirror on the desk or in the medical bag together with other medical instruments. Questa voce è stata pubblicata in Cognition and Behavior. Contrassegna il permalink.